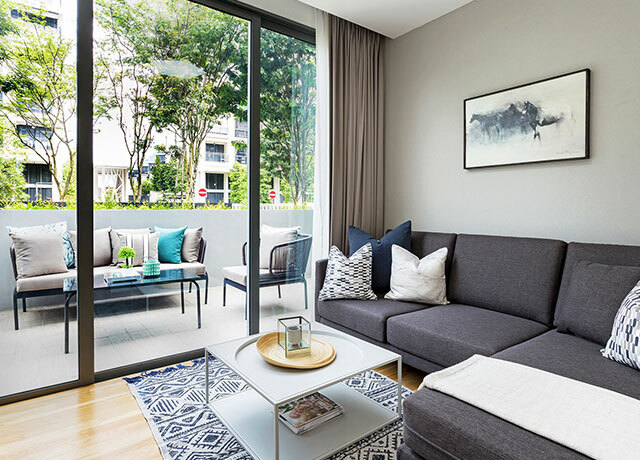 TG Master Pte Ltd (“TG Master”) is relaunching Skies Miltonia townhouse collection by offering foreign purchasers a rare opportunity to invest in a landed home in Singapore. A joint venture between TG Development Pte Ltd (“TG Development”) and Master Contract Services Pte Ltd (“Master Contract Services”), Skies Miltonia is one of the last development in Singapore permitted by the Urban Redevelopment Authority (URA) to build strata landed houses with condominium status. This means that foreigners can purchase these landed homes without conditions similar to a condominium unit. Under Singapore’s laws, foreigners will have to obtain approval from the Controller of Residential Property, Singapore Land Authority (SLA) before they are permitted own a landed property. The only exception is on Sentosa Cove. “We were among one of the last development in Singapore permitted by the Urban Redevelopment Authority (URA) to do this. However, the URA has since disallowed such mixed development with condominium status as of 3rd April 2012. This makes owning our townhouses a rarity among foreign investors at a relatively affordable entry price,” said a spokesperson from TG Master. Located in District 27 in the lush enclave of Miltonia Close, Skies Miltonia’s townhouses are tucked away from the main road of Yishun Avenue 1 to give owners a sense of tranquility. Aptly called “Waterfront Villas”, the townhouses have been cleverly designed to look inwards to the landscaping and water bodies within the development. This is in keeping with its tranquil surrounding which promotes a sense of well-being and to look inwards after a hard day's at work. The water bodies comprise a vast 50m free form pool that gives buyers unobstructed view from each townhouse. The lush landscaping and water features also form a buffer from the common areas. This gives residents seamless access to the townhouses while simultaneously maintaining a sense of privacy and exclusivity. Facilities in and around the pool area have been thoughtfully designed to promote relaxation and a sense of connectedness with nature. They include the Tranquil Garden, Meditation Garden, Serene Garden, Reflective Pool,Leisure Pool, Water Spa Alcoves, Wet Lounge, Pool Deck, Children's Pool and Splash Pad. In addition, the townhouses come with expansive living spaces of 4,672 sq ft. Each townhouse comes with four bedrooms with en suite bathrooms, an entertainment room, a fully equipped kitchen, helper’s quarters, formal living and dining and two private car parking lots spread across five-storeys. A private lift serves each townhouse for residents’ convenience.